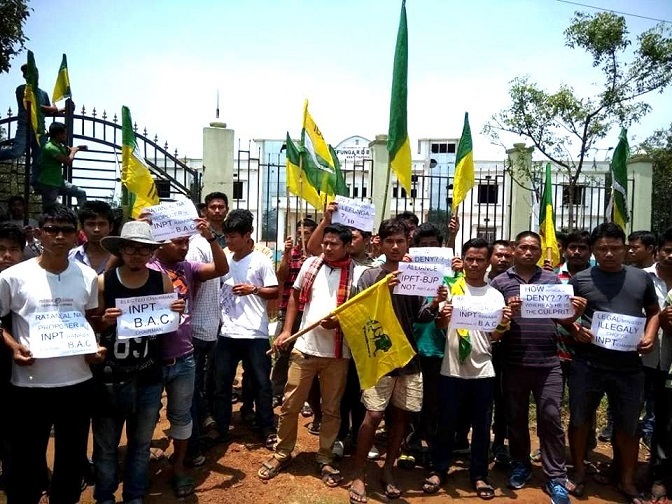 As supporters of Bharatiya Janata Party (BJP) and it’s alliance partner Indigenous People’s Front of Tripura (IPFT) fight it out in Tripura over capturing the post of the chairperson of Block Advisory Committee (BAC), the IPFT central working committee sat on an urgent meeting with all its wings. The day long meeting was held at the Nazrul Kalashetra in which IPFT top leaders including party president N C Debbarma and general secretary Mewar Kumar Jamatia took part along with all youth leaders to sort the misunderstanding between the two alliance parties. During the meeting, the tribal party has decided to propose the government for amendment in the existing Panchayat Act for selecting the BAC chairperson, said IPFT president who is also the Revenue Minister of the State. He added that amending the law may be time consuming and in such a situation an ordinance may be passed so that the situation may be tackled at the earliest. Earlier on May 11, the State Government in a notification declared names of 27 BAC chairpersons which led to fight between the two alliance parties throughout the State. Later, the Chief Minister had asked the IPFT leadership for immediate steps to bring the situation under control and to which Wednesday’s urgent meeting was held. Accepting the tussle, Debbarma viewed that his party had proposed a list consisting of 25 names for the BAC chairperson, out of the total 41 RD blocks but it was not honoured. He also suggested that to overcome the confusions on nominating the BAC chairperson a single window method may be adopted by bringing an ordinance for amending the existing Panchayat Act which has four ways for the same. However, the IPFT leadership denied that they have moved away from their earlier demand of separate Tipraland state for the tribals. Debbarma also announced that on coming May 20, he along with other IPFT leaders are going to Guwahati for the NEDA meeting scheduled to be attended by BJP national president Amit Shah and NEDA chairperson Dr Himanta Biswa Sarma.